In this quick tutorial you'll learn how to draw a Goulds Emerald in 7 easy steps - great for kids and novice artists. At the bottom you can read some interesting facts about the Goulds Emerald. 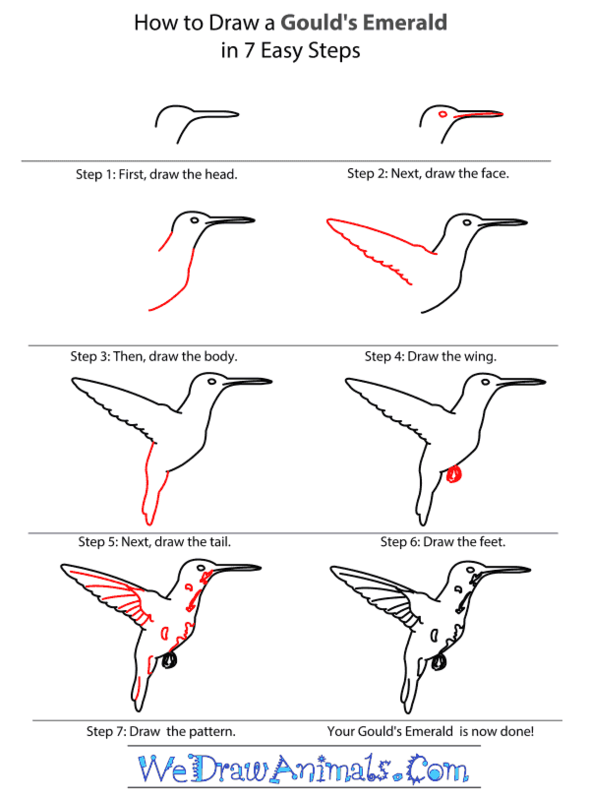 Step 1: First, draw the long and thin beak of the Gould’s Emerald. 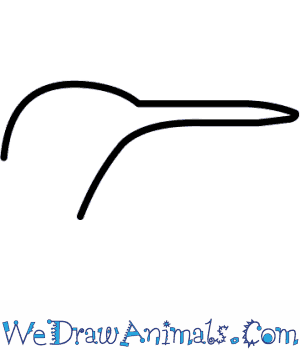 Then, use a curved L- shaped line to draw the rounded head of the bird and add another curved line for its neck. 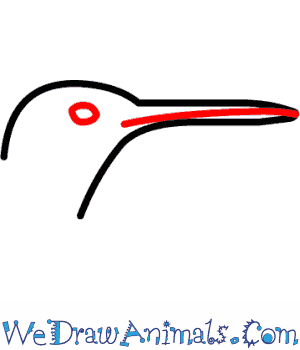 Step 2: Next, draw a tiny circle for the eye and then draw a line down the beak to add detail. 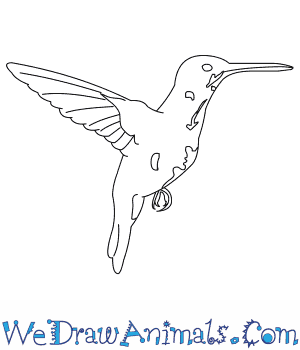 Step 3: Draw the slim body of the Gould’s Emerald using gently curved lines. 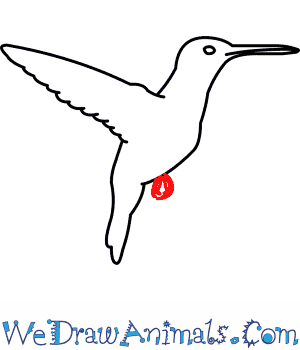 Leave enough blank space for the wing and tail. 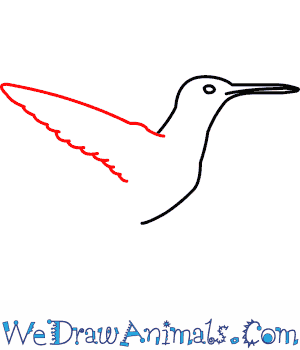 Step 4: Draw the top outline of the bird’s open wing using a gently slanting line. 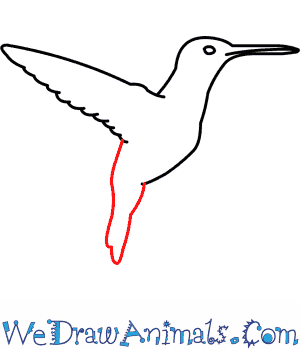 Use a wavy line to show the lower outline of the wing feathers. Step 5: Draw the outline of the bird’s tail using small, gently curved lines and draw the edge of the tail feathers using a wavy line. Step 6: Draw the feet of the Gould’s Emerald using a rough D-shape. Go over the lines few more times to add details of the bird’s claws. Step 7: Let us now add the feather details of the Gould’s Emerald using small curved lines and slanting lines on the wing. 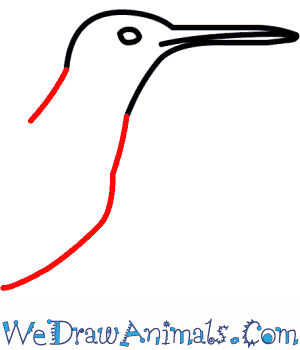 Draw small, rough shapes for the chest markings of the bird. After you finish your drawing, you can color it. Gould’s Emerald was a type of hummingbird that lived on the island of Jamaica. They are now extinct. All hummingbirds are small colorful birds that fly really fast. 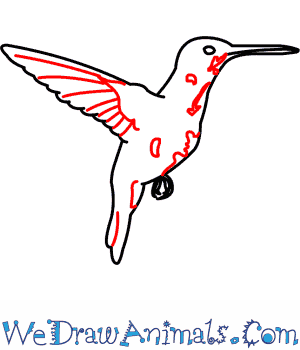 A hummingbird can fly in all directions. Nobody knows why Gould’s Emerald is no longer here, but many think it has to do with habitat changes. Hummingbirds do not walk; they flit everywhere and only stop to perch on ledges. Birds are the most common animal found on the island of Jamaica. Drawing of Gould’s Emerald show the bird as olive green with black coat tails. The island of Jamaica passed through many governments before earning its independence. Including Spanish and British rule. This flux of settlers took a toll on the islands natural resources and many are now gone. A Hummingbird’s diet is mostly sugar and flower nectar. Because they are so pretty, Hummingbirds were often killed for their feathers. A Hummingbird nest holds 1 to 3 eggs a mating season. Lesson Plan Note: Study the island of Jamaica with your class. There is a lot of interesting history on the island and lots of interesting wildlife to discuss too.